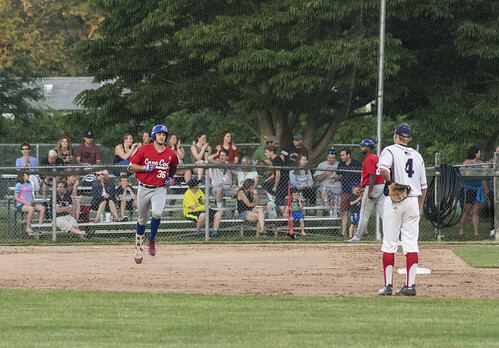 The Chatham Anglers (7-6-2) snapped a three-game losing streak Friday with a 5-2 home victory over the visiting Yarmouth-Dennis Red Sox (8-6-2). Chatham plays the Eastern Division-leading Harwich Mariners (9-7-1) for the first time this season Saturday before making a trip out west to play at the Cotuit Kettleers (8-7) on Sunday. During Chatham’s last four games, three of which were losses, it has averaged 2.75 runs per game. Over that span, the A’s have tallied 28 hits but left 25 runners on base. Tristin English (Georgia Tech) has highlighted the Anglers’ offense during their shaky stretch. The Williamson, Georgia native has slid into the three-hitter role nicely with three-straight games recording two hits, a home run and an RBI. In the three games prior to Friday’s win, Chatham’s five-, six- and seven-hitters were not producing. The group of hitters, which was shuffled each game, combined for four hits over the span. On Friday, Adam Fogel (Hawaii), Drew Mendoza (Florida State) and Ben Ramirez (USC) changed the narrative, combining for five hits, three runs scored and two RBI. While the team has gone through some recent ups-and-downs, there has been one thing Chatham has continued to do really well all season — strikeout opposing batters. The Anglers are tied for the CCBL lead in strikeouts with 151 and are alone at the top with 1.208 strikeouts per inning. In 10 of Chatham’s 11 non-shortened games, the team has punched out nine batters or more, including two games of 15 strikeouts (June 15 vs. Brewster, June 26 vs. Falmouth). Eight A’s pitchers have ten strikeouts or more on the season. Reliever Greg Veliz (Miami) leads the team with 16 strikeouts in just nine innings, while Jeff Belge (St. John’s) has also punched out 16 batters in 12 innings of work. Chatham suffered its third loss of the summer against the Wareham Gatemen on Wednesday. In their three contests against the Gatemen, the A’s have been outscored 25-10. Wareham’s 12 runs on opening day at Veterans Field remain the most runs the Anglers have allowed in a game this year. Wareham’s Joseph Matulovich (California) has faced the Anglers twice this season — opening day and June 27. In his two starts, Matulovich tossed a combined nine innings, allowing seven hits and one run. The A’s will play the Gatemen one more time this summer on July 11 at Veterans Field in Chatham. Despite the Anglers falling in three of their last four contests, its power identity has stayed true. Drew Mendoza launched his first home run of the season on Friday with a solo-shot in the fourth inning. Alongside English’s three-game home run streak, Mendoza, Kyle McCann (Georgia Tech) and Greg Jones (UNCW) each homered in the A’s last three games. All six long balls were solo-shots. Chatham remains the league-leader in home runs with 17, four more than any other team. Despite being 15 games into the regular season, Chatham has still not played neighboring Harwich or rival Orleans. But, that is soon to change. Chatham will face off against Harwich on Saturday. Then, in a seven-day stretch next week, the Anglers play the Firebirds three times and the Mariners twice, including the annual Chatham-Orleans Fourth of July Game. At the end of the season, Chatham plays Harwich in its third-to-last game of the season before playing a home-and-home with Orleans to finish the season. Harwich is currently atop the Eastern Division but has played two more games than the Anglers, while Orleans sits in fourth place with a 5-11 record. After Saturday night’s game against Harwich, the Anglers will travel to Cotuit for the first time this summer. First pitch between the A’s and Kettleers is scheduled for 5 p.m.
Broadcast coverage of the Anglers and Mariners on Saturday begins at 6:40 p.m. with the Anglers Extra Pregame Show. Listen to Cooper Boardman and Josh Schaefer on TRZ Teamline or listen by phone at 1-800-846-4700, code 3841. For more information, visit Broadcast Central.